Yay for another finished project! 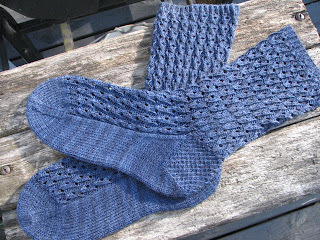 Birthday socks for my mom, who specifically requested navy ones. 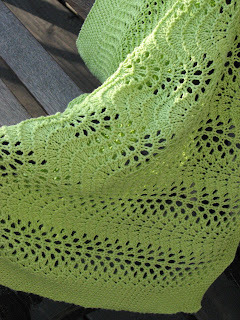 Finally, I can do the big reveal on this project - a feather & fan baby blanket for my friend Roberta, who desperately needs to re-start her blog...hint hint. 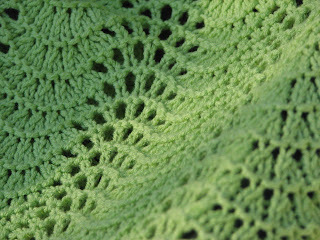 It went pretty fast, as blankets go and the feather & fan pattern is easy to memorize. I love it because you get a lot of bang for your buck with it - looks far more complicated than it is. Yesterday was a busy knitting day. 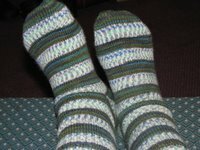 I had just started into the foot of the second Cable Twist Sock and was determined to finish it by the end of the week. 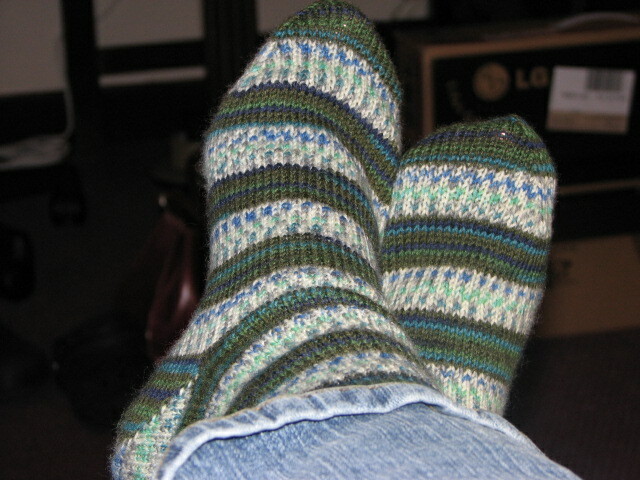 In a rather frenzied state, I ended up finishing the sock late last night. I do hope it fits the intended recipient. 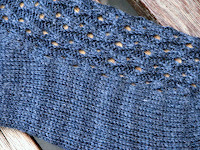 In the midst of working on this sock yesterday, I decided I needed some simple knitting and picked up the Multi-Directional Scarf. I knew I didn't have much further to go, but imagine my surprise when I finished just a short time later! So there you have it. Two finished objects in one day. Yesterday was one of those days where you just can't bear to work on any of your current works-in-progress. I don't know why. 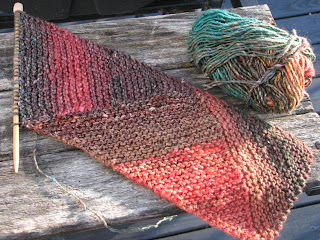 In fact, I even frogged an old project that has been languishing in the bottom of my basket. So what else was there to do but cast on for something new?! 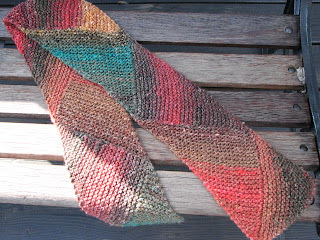 This is Karen Baumer's Noro Silk Garden Scarf pattern, worked in (duh) Noro Silk Garden, color number 230 on US size 9 needles. I am amazed at how quickly this pattern goes. In fact, I have already added another section to it since I took the picture this morning. Tuesday was the mailing day for KMKS - here is what I sent to my pal! 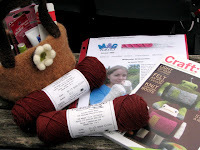 She is getting the Lucy Neatby Fiesta Mittens pattern, two skeins of Lorna's Laces and a skein of Claudia Handpainted, a project bag, a book of spiral-bound index cards in a plastic cover and two types of dark chocolate. I hope she likes it! As it turned out, the person who had me as a KMKS pal needed to mail my package a few days early, so mine actually arrived on the official mailing day. I am very pleased with the things I got! Thank you so much Trish! 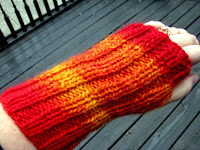 (who, sadly, is blogless) She sent me the Whitewater Wristwarmers pattern from MagKnits, which I had not seen before and really like, along with two skeins of Wildfoote sock yarn in a very nice chocolatey brown to use for the pattern. I also got an adorable felted bag, a set of dpns, a cable needle, an assortment of hand care products and a copy of Craft magazine! 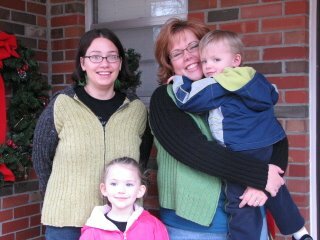 It was easier to just take two pictures than attempt to get out the tripod and use the timer to get a pic of the wristwarmers on both hands at the same time. 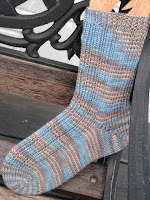 And finally, here is a new sock! I'm calling this one Class Sock because I was recently asked if I would like to teach a Magic Loop class at the lys! 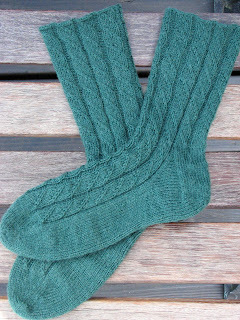 We will be doing the sock toe-up with a short-row heel, using worsted weight yarn. I did 3x1 rib, but people in the class will be able to do whatever they would like. 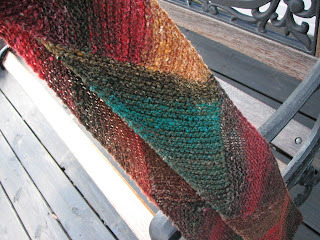 The yarn is Lorna's Laces in Sand Ridge. 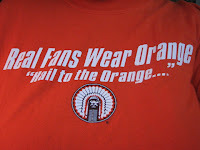 It's game day for the Illini, so it is only fitting that today's SPS photo is of one of my gamers. I discovered that it is a challenge to take a picture of a logo when you are actually wearing the shirt. 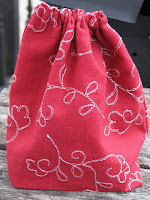 I did do a little crafting yesterday, this time with the sewing machine. I needed to make my bag for the KMKS swap so I can be ready to mail on Tuesday. Actually, I've had everything ready except the bag for quite a while, but I'm quite good at procrastinating. The fabrics I used were ones I already had on hand and I know the color will be appreciated by my pal. 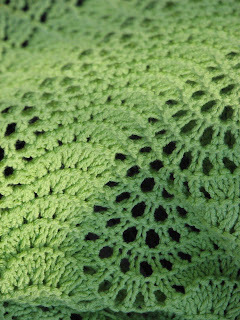 The pattern is Yarn Envy's Leetle Bag - however, if you click the PDF link to save the pattern, you must go in and add ".pdf" to the tag or all you will get is gobbledygook. Probably not colors that most people would like, but I think it's very sunny and happy and I like it. I suppose that's all that really matters. 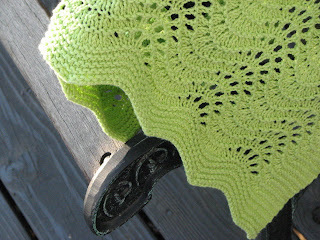 I really like this yarn - the nearly solids. I've read blog posts about it, singing its praises - I will definitely use it again. 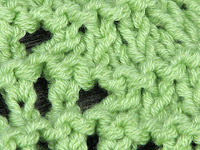 I really like this pattern - easy to remember and looks nice. 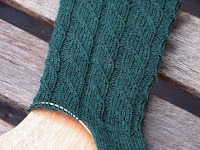 As of this morning, I'm almost finished with the heel flap. 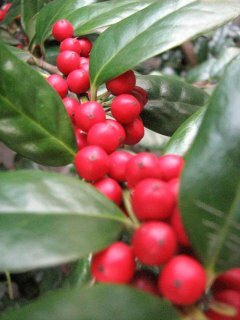 The holly bush that sits at the bottom of our deck steps. Lovely to look at, but the leaves will rip you up. While I was in Missouri visiting the in-laws for Christmas, I had a most unexpected surprise - my Borg cohort decided to take a road trip to see me! This was not just a quick drive for Rose - more like an all-day trip. 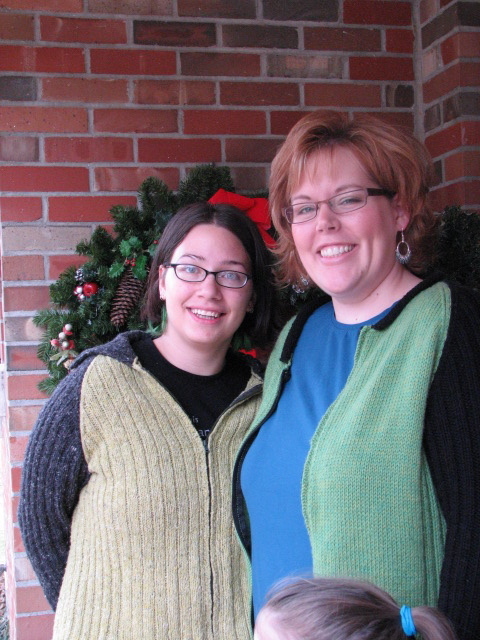 It is hard to believe that this was the first time we were able to meet in person. Of course, our visit was far too short and after a few trips to Panera, it was time for Rose to get back on the road to go home. Since then I have been pondering how I can scrimp and save to make a second visit possible. What would a convergence of the Borg be without a few pictures? And of course we had to get the handknits together...here, Phineas meets the Death Eaters. Tis truly a pity that Oklahoma is so far from here. After seeing all the resolutions to exercise more in knitblog land, I decided to follow suit and participate in Walking to Rivendell. I started tonight on the treadmill and 2 miles later, I am leaving the lane and following the hedgerows south. 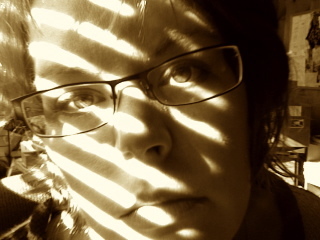 Decided to go with a random photo today, from my holiday picture-taking. 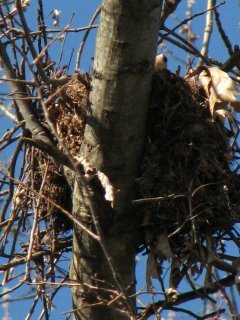 This is a squirrel nest. At least, we assume it is a squirrel nest. It was sitting high up in a tree at my parents' house. Thanks to a decent zoom, I was able to see it better. I'm not sure that I knew squirrels make nests. I don't know where I thought they lived, but this wasn't really what I had in mind. 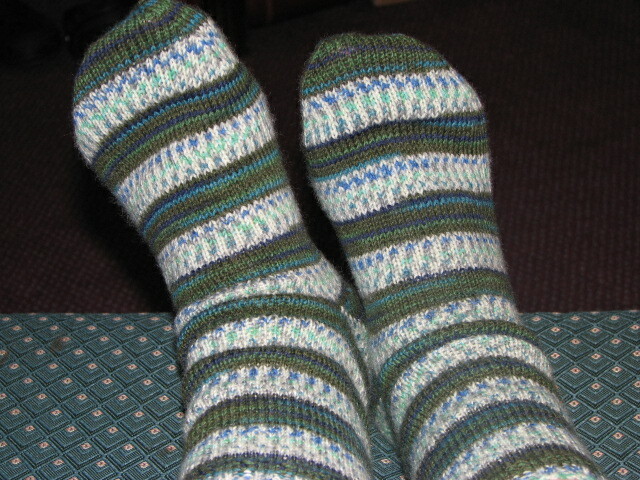 I finished a pair of socks while we were in Charlotte (before I got sick). 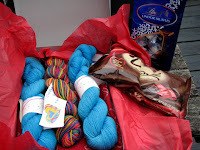 Rosemary sent me this Regia yarn when I first decided to start knitting socks and then it sat in my stash for about a year. 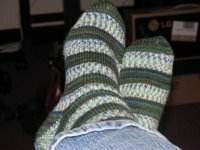 Since the yarn is self-patterning, I knew I wanted the socks to be plain stockinette, but this time I decided to tackle two socks at once with Magic Loop. It worked quite well, but I don't see myself doing it that way very often. 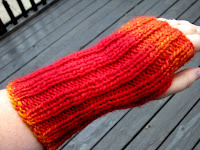 The cuff went very quickly, but once I got into the foot I thought it would never end. I decided to name these socks Arthur. With Arthur Weasley's love of all things Muggle, I thought he would appreciate the novelty of a self-patterning yarn. My new computer has iSight. Hee! After quite an absence, I'm finally home. We were only home for a few days in December, but now all of our travels are over. Technically, that's not true for Greg - he has a few work trips this month, but I don't anticipate traveling anywhere for quite some time. Our trips were not without incident. 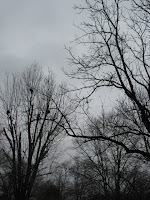 In Charlotte, we had a lovely time until the kids and I got sidelined by the flu. We mostly lay in the bed in our hotel room and moaned and cried because we were so miserable. Couldn't eat, could barely get out of the bed, very high fevers and Greg was working non-stop. Actually, it was probably for the best that he wasn't around or he would have gotten sick, too, which would have been bad. The drive home was miserable and the next day, Natalie and I were off to the doctor because in addition to the flu, she had an ear infection and I had a sinus infection. Thank goodness for strong antibiotics and decongestants is all I have to say! We gave the meds a few days to kick in and drove to Missouri (to Greg's parents') on Christmas Day. We weren't yet totally well, but we were much improved. We had a nice, relaxing visit and came home last night. While we were there, I had a lovely surprise...my favorite Borg decided to take a road trip to come and see me! Rose has a few pics of our visit up on her blog and I will post some just as soon as I unpack and get them off my camera. It was awesome to finally meet her in person, but our time together was far too short. I did manage to do quite well for my birthday and Christmas gifts - birthday brought me a new camera and Christmas brought me a new 17" iMac. Believe me, I don't normally get such extravagant gifts, but this year they were both needed. So once I get the new computer all situated and set up, expect to see more pics in the blog! 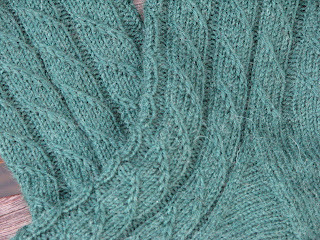 There has been some knitting while I was gone...but no pics yet. 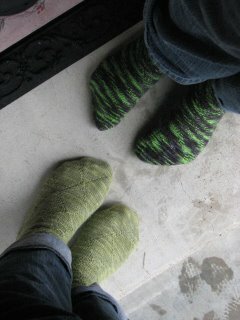 I finished a pair of socks in Charlotte and also knit a new hat. I have knit two kid mittens (but not a pair), two kid scarves, two kid hats, have put a few more reps on Clapotis and am nearly finished with a new sock. Now that I type all of that, I'm quite impressed with myself. 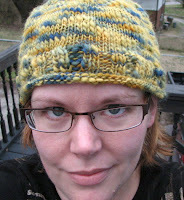 Not bad for the holidays and being too sick to knit for over a week.